Pet safety usually means keeping your pet safe. In part, it's keeping yourself and others safe from your pet's instinctive behaviors. I had a friend that told me I couldn't stare her kitten down. As a less-wise-than-now young woman, I was always ready for a challenge. So I stood directly in front of the kitten and started staring. He stared right back. I continued. So did he. Finally, I knew I would have to blink. I snarled my most cat-like, "Meow!" Without batting an eye (because that would have been blinking) he jumped on my head and stuck fast. My friend had to extricate him, paw by paw. Being a fast learner, I have never done that stupid thing again for the last 40+ years. Pay attention to your cat's body language. 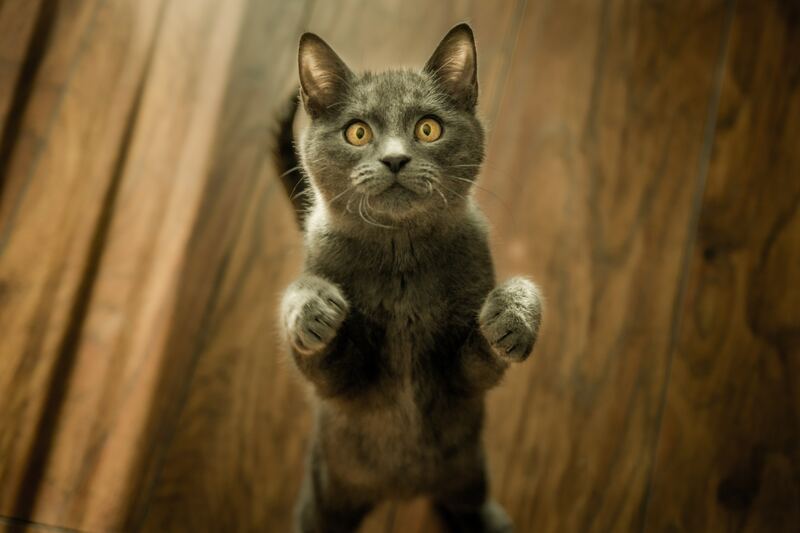 Your cat can’t tell you “no” but she has every right to defend herself against unwanted attention. She will fight tooth and nail to preserve her autonomy. Her teeth and claws are the only defenses she has. If your cat bites when you rub his tummy, quit rubbing it. Cat belly's are often no-touch areas. My neighbor has a beautiful cat that she aptly named Beau. He is a big, beautiful lovable guy. One day he flopped down right in my path and presented his chest for a rub. I forgot that cat belly's are often verboten. I also forgot to look at his tail. If I had, I would have noticed the flicker. That belly looked so inviting for a little tickle, a little rub. Uh-oh! His presentation wasn't an invitation. It was a dare. My bad. It was a game and Beau made the rules! Pay attention to your cat's tail. The movement you see there isn't wagging because cats don't wag. Really. Why would they? Wagging is a sign of appreciation. "Thanks for paying attention to me. I love you so much! Do you have time to pet me now. I love you, love you, love you!" Cats don't have time for that kind of puffery. That's for toadies, fawners, bootlickers, and (ahem)dogs. When a cat's tail is either flicking or swishing, it is the exact opposite of wagging. Flicking is a warning. It says, "stop what you're doing." Swishing is a direct threat. It's your sign to run for cover! Keep your hands away from his face. If you don’t he will regard them as either toys or objects of aggression. Cats do enjoy having the top of their heads, their cheeks (jowls), and chins scratched. These areas put their scent on you. Don't approach these areas head on, palm down. Show the cat your palm as you come in from the side to pet him, palm up to scratch his chin. Remember, cats do not like their whiskers tweaked. Cat whiskers are not normal hairs. They are sensors and they are ultra-sensitive. Keep your hands away from them. When you approach a cat, if he pulls back, you pull back. Read up on cat behavior and cat care. Your cat already knows why he bites or scratches. It's up to you to find out what he knows. If you've been living with a cat for over a week, you know that telling her “No” doesn't cut it. You need to change your behavior before you can begin to modify hers.